Webmaster's Note: The demand for more direct support artillery shortly after the arrival of the 2/9th Arty in Vietnam was more than we could supply. Consequently, the decision to "split" was made. Here is an account of the "split". Stretching rations is a relatively simple task. Stretching thousands of pounds of cold, howitzer steel is another matter. But that was the job facing Lieutenant Colonel Saul A. Jackson, commander of 2nd Battalion, 9th Artillery. The problem of creating five artillery batteries from the usual three arose when 3rd Bde. began Operation “Paul Revere” southwest of Pleiku. It became necessary to alter the face of the battalion’s three batteries, each having six 105mm howitzers, plus personnel and equipment. 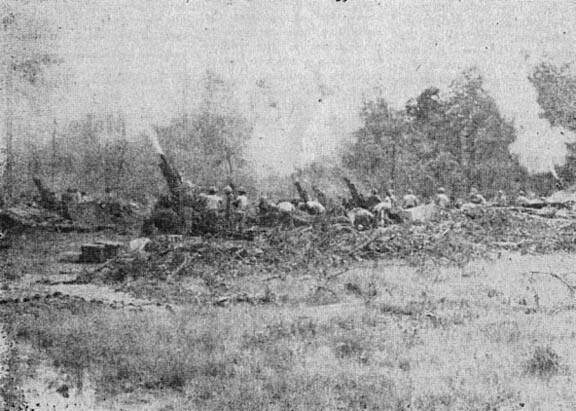 Col. Jackson and Major William H. Schneider, the “Mighty Ninth” operations officer, resolved the problem by moving two howitzers from each of the organic batteries. This left the three original batteries with four howitzers each and gave the brigade five 105mm howitzer firing batteries for support. The facelifting now leaves 3rd Bde. with a highly maneuverable artillery force capable of defending the Pleiku base camp while still supporting field operations. The 2nd Battalion, 9th Artillery, boasts of one of the most charged batteries in Vietnam . During the 3rd Brigade’s recent heavy contact with the North Vietnamese Army units, additional firepower was needed. As a result, Battery A, of the “Mighty Ninth,” was brought into action.